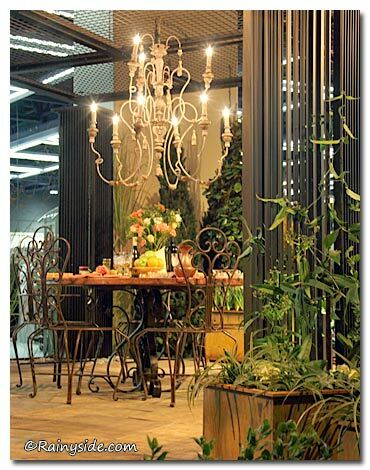 Renewal: Enchanted April in the Northwest is a lovely urban garden inspired by a fictional book and movie about an Italian villa set in the 1920s. Warm, golden sandstone boulders and pavers, along with punches of bright, spring green displayed in cozy reclining patio chairs and benches are used to give this garden the sun-kissed look of Tuscany right here in the cool, rainy Pacific Northwest. The cheerful orange, chartreuse, and yellow colors of the plants are echoed in the gorgeous and inspired use of glass globes in the fence and gate of this welcoming garden. 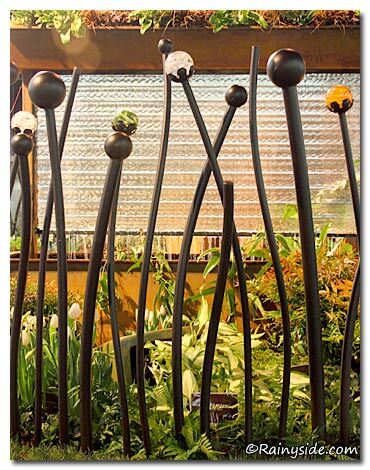 James Curtis, glass artist craftsman worked with metal artists Jim and Lisa Honold to construct this whimsical fence and gate. The fence is designed in such a way that the fence could be purchased and installed one piece at a time. Currently, the glass globes are unlit but James has plans to install light bulbs so that the fence may be enjoyed with a touch of a button on a warm, summer evening, or if you are like me, on a cold, winter night. Designed by Jim Honold and Pamela Richards.